Rebel Yell has made her mark in Aus for creating confronting techno music. 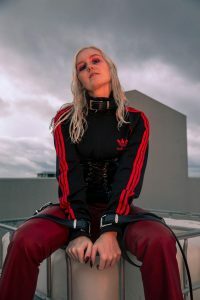 Grace Stevenson, the individual behind Rebel Yell, has once again delivered a unique brooding track. We are very excited to announce the release of her latest single ‘Pressure Drop’. ‘Pressure Drop’ is officially released this Friday, February 16 and is the first single to be taken from her debut album Hired Muscle, set for release this June! ‘Pressure Drop’ is a song describing a Rebel Yell set, a track about experiencing the night and dancing – “Rebel yell, feel the pressure”. Stevenson creates a heavy, haunting experience within her music. With a Korg ESX-1, volca bass and vocal processor amongst others in tow, Rebel Yell summons a unique and dark style of EBM bangers. Rebel Yell is a musical enforcer, her music effortlessly convinces or reminds you, that she is the boss. We are so excited to be delivering a full-length Rebel Yell album this year and know you will all feel the pressure.